It is backed by Twitter, Paypal, Facebook, Udemy, Netflix, Uber, the Walmart and many such more organizations. It has a great community and helpline; it is easy to learn since its syntax is simple to understand. It is highly flexible and responsive. Redux and react-native are also very successful tools and are very helpful. With React the data flow from the child elements cannot affect the parent data. React is not properly controlled, which means that the developers have too much choice which can be a bit of a headache at some time. React is easy to use but it takes a long time for its mastery, it requires deep knowledge. For example, to integrate user interface to the MVC framework, it takes time to master. Google backs it so we can expect lots of updates and improvements. It is a popular framework for front-end developers and is used by giant organizations such as Forbes, WhatsApp, Instagram, and many fortune 500 companies. It provides detailed documentation that allows the individual developer to get the necessary information without having to ask his fellow developers he is working with. Data binding is possibly mad two-way to reduce the risks of possible errors in the framework. Developers tend to hate Angular since it has a high learning curve. Migration issues which appear when moving from the older version to the newer version. If Google does not change some changes, it does not have a bright future. Often used by giant corporations like Alibaba, GitLab, and Baidu. Like Angular, it has detailed documentation which can hasten the learning curve for developers. It has adaptability, i.e., the ability to switch from other frameworks to Vue. Due to its tiny size of around 20KB, Vue is rapidly fast and flexible, that allows better performance compared to other frameworks. It can be used to build single page applications and more difficult web interfaces. Vue is not backed by any big companies, which is crucial for the growth of the framework. It still does not have many users and hence only have a small market share in comparison with Angular and React. Due to its high flexibility, there can also be the problem of over-flexibility which means issues while integrating projects. The Documentation is still not widely spread in English, which is hoped to be fully translated into the language soon. 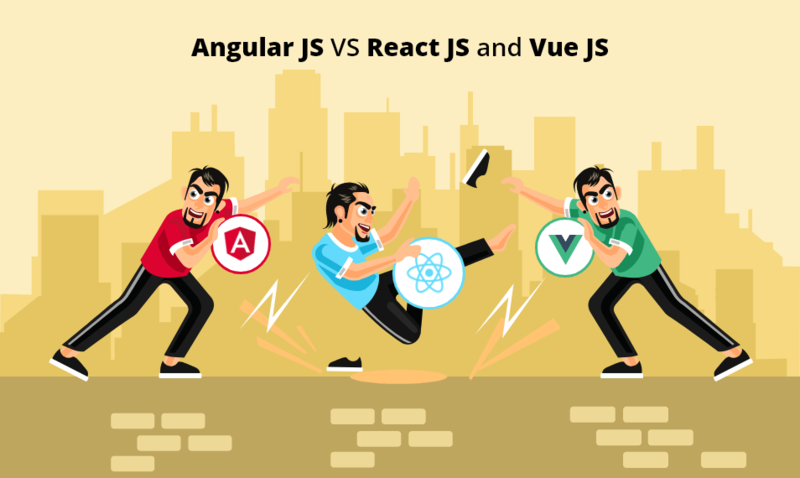 If you still did not know what to choose between the three, if you like flexibility and loves JavaScipt then opt for React, for coding and object-oriented programming go for Angular if you like clean codes and separation of concerns in the app go for Vue. Vue is mainly used for a small team with a small project. If the project is large and has a bright future ahead go for either Angular or React.